Our popular Friday Night Football sessions, in partnership with Tamworth In The Community are continuing throughout the 2018/19 season. 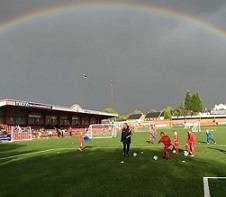 Sessions are available for those up to 12 years old, and are delivered by fully qualified Tamworth Academy coaching staff here at The Lamb on the state of the art 3G playing surface. Thanks to funding from The National League Trust, sessions are FREE for all participants!